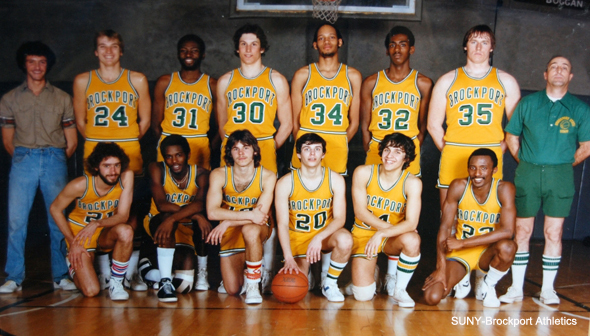 The folks over at The Basketball Jones shared the above photo of Orlando Magic head coach Stan Van Gundy from his playing days at State University of New York at Brockport. The Jones played a game and had readers guess which player was Stan Van (I guessed wrong). I’ll spare you the time and reveal that he’s that smiling young lad in the front row, second from the right. Just the pairing of Van Gundy’s expression with the hyped PA announcer and the pump-up music gets me every single time I watch that. I’m not sure what type of player Van Gundy was in college. The fact that he played at the unknown SUNY-Brockport might be some hint to his talent. But if this recent video of Van Gundy doing his best And-1 Mixtape Tour impression is any flashback to the past, even with his roundish midsection, then he might have been pretty decent. This entry was posted in Fun stuff and tagged nba, orlando magic, stan van gundy. Bookmark the permalink.